Editor’s note: James F. Collins, a senior associate and diplomat-in-residence at the Carnegie Endowment for International Peace, was the U.S. ambassador to the Russian Federation from 1997 to 2001. The views expressed are his own. The issuance of an arrest warrant for deposed President Viktor Yanukovych at the weekend was just the latest twist in a dramatic few months in Ukraine. But if the country wants to achieve accountable government, economic recovery and preserve its sovereignty, territorial integrity and independence, it is vital that all sides focus on reconciliation, a political way forward and most immediately an end to violence. 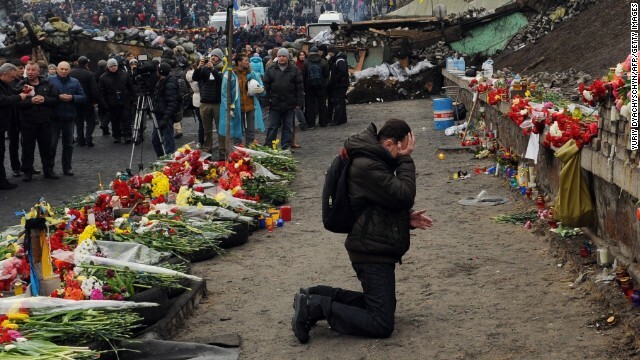 Of course, seeing, hearing and living Ukraine’s present agony, the impulse to do something is unavoidable. The images of a Maidan on fire, bloodied faces in helmets and headscarves, and flames engulfing the heart of Kiev moves anyone who cares to rage at the senseless brutality that has engulfed the heart of this new nation. But there is little more disheartening than the reversion of outside commentary to talk about Ukraine’s catastrophe as some kind of Super Bowl conflict between the U.S. and Russia or East and West – and an obsessive focus on who is winning and losing. It is quite clear that the real losers in this conflagration are Ukraine’s citizens, whose fate is in the balance and whose future is perilous. The reality is that the major part of Ukraine’s present condition is home grown. From the earliest moments of independence, Ukraine’s citizens have let their divisions – cultural, linguistic, religious, and economic – drive their politics. At times, the country’s leaders have risen above narrow interests to reach compromises and set down foundations for a united future. But too often, these compromises left unaddressed deep-seated mistrust, centuries old historical grievances, and perceived and real inequities in the distribution of Ukraine’s economic wealth. It was also easier to postpone difficult decisions to restructure the nation’s economy and incur the costs involved in giving Ukraine the economic base required for stabile political independence and sovereignty. Ukraine’s leaders and elites on all sides have a heavy burden before their people in letting conditions reach today’s unpredictable and unsettling circumstances. To gain advantage in this “game” they have cajoled, threatened, rewarded, promised, warned, and offered in order to attract or dissuade Ukraine’s leadership from moving in either direction, and they provided Ukraine’s leaders with ready-made excuses for failing to define their own course or make needed decisions and compromises. Last year’s ill-fated efforts by the EU (with American backing) to draw Ukraine to decide for the West via the Eastern Partnership Agreement, and Russia’s efforts to induce or cajole the country to become a partner in Russia’s Eurasian Customs Union/Eurasian Union, represent the most recent – and it has now become clear – the most consequential episode in this drama. For the moment, Ukraine’s prospects and future are as unpredictable as they are problematic. Divisions are deeper in the country than they were before the latest violence. Healing the results of bloody street fights, escalating harsh rhetoric, and demonization of each side by the other will demand commitment and determination by all involved – including the country’s political and business elite, its academic, cultural, and religious institutions, and its intelligentsia. It will take maximum effort by all these actors to heal and build at home, to ensure that those today pushing agendas that will further split Ukraine (e.g. reopening the linguistic wound) gain no traction, and giving Ukraine the opportunity to shape a more secure and peaceful future. But no less important at this moment will be the response of those outside Ukraine. For them, a deep look inward at the policies and actions they have followed in response to Ukraine’s geo-cultural schizophrenia is overdue. If events of the past days say nothing else, they confirm the absence of consensus among Ukraine’s people and elites about their country’s future. There is no consensus about direction, relations with neighbors, or domestic development model. Efforts by both western and eastern neighbors to force the pace toward such consensus or to direct its outcome have clearly failed to avoid catastrophic results, and have contributed to the threat of an unstable nation in the heart of Europe or worse. That outcome serves neither the interests of the United States nor the European Union nor the Russian Federation. In the circumstances, it is in the fundamental interests of all to set at the forefront peaceful reconciliation within Ukraine, development of its economy in a manner that prevents dependence on subsidy from any quarter, and stabilization of the political life of a nation. This is vital to security for the entire Euro-Atlantic region – a peace in the heart of Europe. Ukrainians themselves will determine whether their next experiment in creation of a new state can proceed constructively. But outside neighbors and partners will continue to have influence over how the process unfolds. A continuation of past policies pressing Ukraine to choose between East and West will almost certainly make this process more difficult and fraught. An approach providing Ukraine with breathing room and time is more likely to create a favorable environment for a positive outcome from Ukraine’s next stage. Such a policy would serve the interests of Russia, the EU and the United States. Ukraine’s agony over recent days and weeks has clearly demonstrated the danger of continued failure to address the underlying issues that face the country. The hope for the future is that Ukraine’s citizens can focus on their shared needs and national interest – and that its neighbors will cooperate to encourage their success. Next entry »Should Spain rethink its late night lifestyle? There is a good chance that the US unemployment rate is at 6.5% right now. This is the main indicator set forth by Ben Burnanke as an indication that the economy is improving towards health. The global economy should start growing at a faster rate at this point. Go Bulls! Except @ Jal, everyone knows that is NEVER accurate! That only portrays the number of people recieving unemployment. It does not count the number of people whose benefits have expired that are still NOT employed. Another fictional number used by government to make themselves better every day! Oops meant make themselves "feel" better. The world does not need a new USSR. Putin and friends must be stopped now! Wrong, sixthromeo. It's the right-wing thugs in Washington, London and Paris that sorely need to be stopped. Today, their countries form the true Axis of Evil in the world. For fighting Russia western world is now ready to use Nazism again? People, I am from Ukraine. What do you know about my country or my history??? You know just about Cold War. And you can describe my history in two sentences.... I am from Crimea and our hand is with Russia!!! Putin very wise politician! another troll trying to convince the west otherwise ! Russia is a true evil empire that needs to be broken up into pieces that will end its continuous negative impacts on the whole world ! James F. Collins has it right. Of course Ukraine is not a tug between Russia and the West. The reason for this is that after the Soviet Union dissolved in 1991 and Ukraine became independent, the West has put Ukraine on it's calender of conquest or so it seems. The Russians, on the other hand, don't want to take it back but still want it as a trading partner. Now Ukraine seems to have fallen to the cursed EU! 70% of Ukraine's population speaks in Russian. Today if you speak Russian in Kiev you have a great chance to be beaten. Fourth Reich on the march. Thank you, denis. How true that is! The future for Ukraine does appear very bleak indeed now the the Fourth Reich has arrived there in force. World leaders all want to preserve Ukraine's territorial integrity. The problem is that when differences no longer are bridgeable, a breakup might just be the appropriate answer to Ukraine's East/West divide. Look at Belgium, which is also deeply divided between the French-speaking Wallonia in the south and the Dutch-speaking Flanders in the north. Some speculate Belgium could break up one day. Quite right, j. von hettlingen. Maybe Ukraine will do better if their country were to be split between the Catholic Western half and the Eastern Orthodox Eastern half. This is what needs to happen in Iraq! Watch PUTIN turn the Ukraine into another Syria while the rest of the world stands by and watches. No one will tell or Say that Russia is an evil Empire that supports Dictators and supplies arms to Kill Millions of People in the name of what ever is in the Interest of Russia. Who Created North Korea, where did they get the MIG Jets they flew in the 1950's. Who is supporting IRAN become a nuclear power, who is supporting IRAN to cause Revolution and Genecide in the Middle East. PUTIN is no better than Stalin when it comes to rights of humans and killing civilians. And just who do you think had the Amriya air raid shelter in Baghdad, Iraq bombed on Feb/ 13, 1991, slaughtering well over 414 innocent civilians in cold blood, Terrence? And just who is using those ungodly drones to kill civilians in Afghanistan, Pakistan and Yemen today? And finally, which country is the only one to ever use the nuclear bomb on civilians? Don't you think we ought to look at ourselves before we judge other, Terrence? As the saying goes, "Judge not lest ye be judged". In hiding President Viktor Yanukovych is probably one that Moscow will harbor as a spare card. Even if he is of no use to them at present. Just exactly like in the manner of the west saving the skin of the woman ex president Yanukovych had thrown in prison. The good way to avoid a war,all leader need to think about human life, the leader who only thinks about their interests and personal life only bring more bloody, hope all leader need to bring peaceful life to their people and all other people around the world. Not create other mistakes again, look back in histories, all wars were destroying human life and brought them saddenness,lost families, sickness,live very poors, live like hell, who did all those, only bad leaders, who thinks only their personal interests, and for themself. The good leaders, who bring peaces to everyone and avoid all combats or wars, creates jobs and educations to help their own people and other people around the world live happier and safer. Wishes all leaders bring peaces to everyone and give people a chance to lives, and save the Earth, if a war now, it will be dangerous with news technologies weapons and mechanicals will creates extremly hots, the Earth may explores in future,the Global warning every where in the world right now. If all leaders in the world come together and bring peaces for each people around the world. There will still has time to save our planet, and save many human life. Hope God Bless each of us and all leaders. But Ukraine is not just independence or mere question of leaning. Ukrine is about East vs West politiclal-economic [needless to say military] alignment. And right now it looks like President Viktor Yanukovych is an underdog. Ukraine faces the prospects of becoming pawn in a war of proxies. civil war can break loose any time and Russia will say it has nothing to do with it except to safeguard Russians interests. And U.S. will likely jump in or pull strings to help Ukraine independence that to the Russians translate as political-economic [needless to say military] grab by the west. I think, if you ask the simple Ukrainian in the streets he will tell you that all he dreams is a working government free of corruption and a country at par with any independent ones. Hey guys, I have chatted with many former Soviet citizens, who now live in California, because they fled Russia to come in live in the much better USA! One of my closest friends fled from Soviet Armenia. You see guys, he is Russian, and during the 1917 revolution, his father was part of the Soviet Army that occupied Armenia, just like it did in over 26 neighboring states, to form the USSR. So after Gorbachev freed the Soviet Satellite States, in 1991, many Russians occupying those States had to flee for their lives. The natives living in all those "republics" had been murdered and thieved from for 70 years, by Soviet troops!!!!!!!! That's why all those former Soviet Republics broke away!!!! So now, Putin the thug wants to get back the old glory of the USSR......... good luck......... he can only do it by murdering over 10 million people!!!!!!! How sick are we humans??? It is ironic that Russia accuses the West of being a bunch of Nazis. Perhaps he is peering in the mirror. Realistically, Russia should just buy Crimea for about four hundred billion dollars from Ukraine. The Crimea was a part of Russia for three hundred years. In the 50s, Khrushchev, a Ukraine, turned the administration of Crimea to Ukraine. Ethnic Russians make up 68% of Crimea, Ukraine 24%. The US has never had a long-term foreign policy, NEVER. Perhaps Putin has. The guy that was chased out of town by a mob was elected in a free election, Until he is impeached he is still the President of Ukraine. This guy was leading Ukraine away from US policies. Now, what happens when someone does that? Am I the only one that sees the fine hand of the CIA all over this event? They have engineered the overthrow of quite a few freely elected governments whose policies differed from ours. As for Putin, he is a spy master, he knows exactly what the CIA is doing. He knows that the end result will be much larger civil war in the future. Putin is making a smart move. You All need to know regarding recent Russian statement about II world war crime which took place in current Ukrainian land former Polish , where as per Russians : Ukrainians UPA OUN "parties" bestially killed Polish officers , leaders etc, all know about it but , when we look deeper into the Ukrainian History all those parties at their beginning especially UPA leaders and other as well were people send from Russian government to infiltrate Ukraine and Poland as Poland that time owned approx 50% of current Ukrainian land .and Those Russian Leaders created UPA OUN Parties which killed innocent people including children , pregnant woman, and even locals which was trying to help them , so as You can see Russia is the biggest problem from the very beginning and latest statement is only political game for people which don't know a history Putin and his people are aware of everything and they know the history very well so please I am talking to the other countries which participating in this conflict as I noticed most of them they are not aware about history of Ukraine, Russia and Poland look into it a bit deeper then you will understand all Putin's movement , and I believe this is the goal now ! Has anyone commenting here read the article? It says Ukraine is not a football game for our amusement. When behave as if it were, when we root for one side or the other we are making it harder for the Ukrainian people to come together and find solutions. The author says this type of commenting is part of the problem. Most of us have consciences, most of us can do better - can't we?? The Ukraine has little option. Russia is in the driver's seat, and that will NOT change. Just wanna comment on few general things, The website pattern is perfect, the subject matter is real wonderful :D.